Chimney height rules: Height & Clearance Requirements for Chimneys - how high must a chimney be, what other chimney clearances are required for fire safety or function? This article describes the height requirements for chimneys, including rooftop clearances and overall chimney height necessary for proper chimney draft and function and for fire safety. We describe what can go wrong with chimneys that are not built to proper height or with proper clearances from other building features, including improper or unsafe heating appliance or fireplace or woodstove operation, odors, soot, draft issues, etc. These articles on chimneys and chimney safety provide detailed suggestions describing how to perform a thorough visual inspection of chimneys as well as chimney construction & repair methods. A variation on a "too short" metal or masonry chimney is a chimney that may look tall-enough to some folks but which lacks adequate clearance from a nearby roof slope, as we illustrate and explain in the text below. Chimney to Roof Clearance: from the ground you can guess and from on-roof access you can measure to determine if a chimney is simply too short for fire safety and code compliance. The length of a horizontal line drawn from the top of the opening of the chimney flue to the point at which that line touches the roof surface should be ten feet or more (the blue line in our photo). And the top of the chimney flue must be at least 2 ft. above that point. In our photo, our measuring tape is pulled to about 4 1/2 Ft. - this chimney top is too close to the roof surface (the horizontal blue line) and too short as well (the vertical green arrow). Detailed specifications for chimney vertical and horizontal chimney clearances are given below. The height of the chimney above the roof surface, measured at the up-slope side of the chimney, from the roof surface to the chimney top, should be at least three feet - the green line in our photo. This is a bit of an odd measurement and chimney clearance case because the chimney side is actually about 8" away from the roof edge. But the chimney-to-roof clearance rules still apply. This measuring tape location shown in this photo is slightly incorrect (I didn't want to lose my tape down the flue while taking the picture). Measure from the edge of the chimney flue closest to the roof, horizontally, until you touch the roof surface to check the ten-foot clearance rule distance. That's the light blue line in our photo. Check the chimney top for damaged masonry (or rusted metal), a missing cap, damaged, cracked, or missing top seal or crown on the top of a masonry flue, and here, an important discovery (at least in some jurisdictions) is whether or not the chimney is single wythe or thicker masonry and whether or not the chimney has (or perhaps needs) a chimney liner. 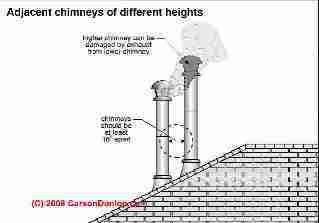 SHORT CHIMNEYS - WHAT IS "TOO SHORT"
More chimney and flue clearance and distance articles are given at the ARTICLE INDEX at the end of this article. 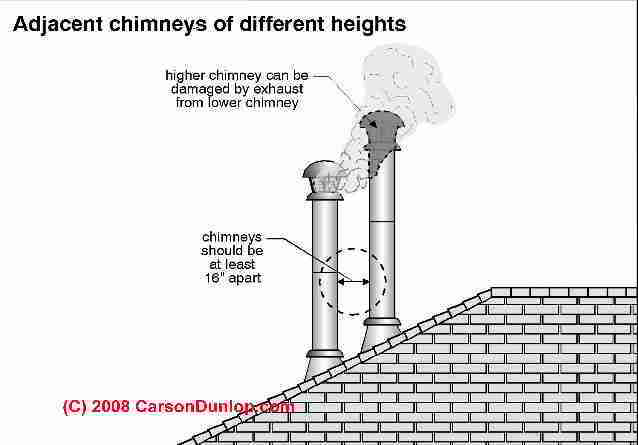 Chimneys Too Short - What is "too short" and What Problems Occur? A chimney that is too short is unlikely to vent properly and it may also be a serious fire hazard to the building, risking setting the roof on fire. The photo above is a too-short masonry chimney (with no cap and other worries). A horizontal line (blue in our photo above) drawn from the chimney top to where it would touch the roof surface was just about one foot instead of the required ten feet horizontal distance to the roof touch-point OR two feet above the ridge. 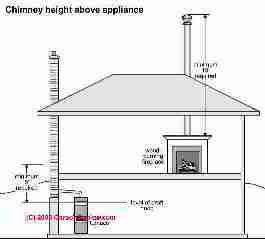 The chimney shown above also violates the NFPA 211 1-8.2 rule requiring at least 5 ft (1.53m) above the flue collar. Natural draft chimneys and vents shall not terminate at an elevation less than 5 ft (1.53m) above the flue collar or the highest connected draft hood outlet. Inspecting from outdoors you may not be sure if a chimney violates this rule or not - you'll also need to look inside at the heating equipment and at the building structure, ceiling height distances etc. to make an actual measurement. This chimney termination no less than 5 ft (1.53m) above the flue collar or the highest connected draft hood outlet height rule is to assure that the chimney will develop adequate draft. A "too short" chimney in this case won't have a tall-enough column of rising hot gases inside to develop a safe, adequate draft. Our photograph shows a "too short" chimney through a flat roof on a one-story home. Watch out: This too-short chimney is more than a fire hazard. It can mean that heating equipment venting into the chimney won't work properly, is unsafe, or is "forced" to work by settings that waste your heating money. The vertical distance from the top of this chimney to the top of the oil fired heating boiler it serves is less than six feet. Our vertical red line shows that we measured about 24" of chimney above the flat roof. This seems to meet the "two foot chimney rule" but it fails the three-foot rule and also the whole chimney height was just too short to produce adequate draft. The oil fired boiler has blown soot into the utility room and garage throughout its' life, a constant source of annoyance that probably stems from inadequate total draft even when the oil burner, boiler, and chimney flue are up to full operating temperature. see OIL BURNER NOISE SMOKE ODORS. An oil fired heater with insufficient draft or that is sooting-up for any reason risks a dangerous puffback explosion as well. The draft regulator on this installation was removed by an earlier service tech in an effort to improve draft in the flue. But even that step was not enough, and of course now the oil burner can never be properly tuned. In response to owner pleas that no one had been able to fix this trouble, an oil company's service technician who worked on this flue in 2010 "solved" the long standing oil burner soot problem by setting the draft up as high as he could at the oil burner. That slowed but did not stop the sooting problem, and for sure it increased the heating cost for this building. Stack temperature was 600 degF (photo at left) - minus room temperature, making it about 530 - a bit high. We could have addressed this short chimney with a draft inducer fan, but a taller flue would be smart anyway, to get the chimney top higher than the roof surface. Just how short is "too short" - we discuss chimney height and roof clearance requirements beginning below. Particularly with gas fired appliances, the lack of adequate draft for any reason, including a chimney flue that is too short, can result in improper combustion and the production of dangerous, potentially fatal carbon monoxide gases. And the same inadequate draft that affects combustion in the heater can increase the risk that the gas backdrafts out into the buildings. ... A chimney or vent shall be designed and constructed to develop a flow sufficient to completely remove all flue or vent gases to the outside atmosphere. The venting system shall satisfy the draft requirements of the connected appliance(s) in accordance with the equipment manufacturer's instructions or the chapter on Chimney, Gas Vent, and Fireplace Systems of the Equipment Volume of the ASHRAE Handbook. An obvious fix for a chimney that is too short to meet the height and fire safety clearances mentioned earlier is that the chimney height must be extended above the roof for fire safety. 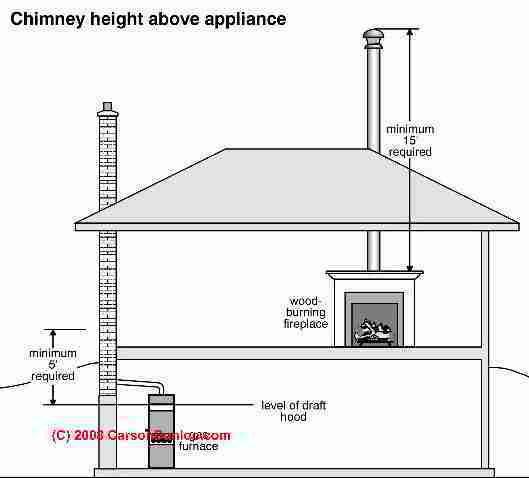 But in some installations, such as a heating appliance installed in a one story low ceiling structure, the chimney may meet the fire clearance specifications (NFPA 211 1-8: Termination Heights) but it not be tall enough to develop adequate draft (NFPA 211 1-7). In this case it is permitted (NFPA 211 1-7-2.) to use a draft inducer fan ("a mechanical draft system of either forced or induced draft design"
discussed at DRAFT INDUCER FANS to meet the draft requirements. Watch out: if you use a draft inducer system the installation must assure that the heating appliance won't run if the draft inducer is not running. Most if not all modern mechanical draft or draft inducer systems include this safety feature as do direct-vent or side-wall vented appliances that use no chimney at all (another solution to some chimney problems). Also see COMBUSTION AIR for TIGHT BUILDINGS. The sketch at left shows the proper minimum chimney height and roof clearances for a masonry chimney. In my sketch the black double-headed two-foot arrow shows that the top of the chimney has to be two feet above the point on the chimney that would be touched by a ten-foot-long line drawn to the nearest point of contact with the structure - in this case the roof surface. The top of the flue opening should be at least 3 Ft (0.92 m) above any roof surface. The vertical green arrow in the sketch - I.e. a vertical line drawn along the up-roof side of the chimney, from the roof surface to the top of the chimney flue opening shall be at least 3 Ft in height. This is for masonry chimneys. For a gas vent or Type L vent this height must be 2 Ft (0.61m) or more. The top of the flue opening (termination of the chimney) should be a minimum of 2 feet above any part of a structure within ten feet. Vertical blue arrow in our sketch. Notice that we use the words any roof surface or an part of a structure in this explanation. That means that if there are other nearby structures, say a dormer, the same clearance rules apply. The photo at above right is a too-short metal chimney that is less than two feet above the ridge. The top of the chimney should be at least 3 Ft (0.92 m) above the roof surface. This specification makes sure steep roof slopes are cleared. 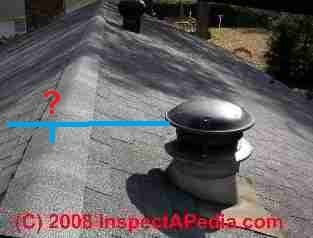 For gas vents or a type L vent this distance above the roof surface must be at least 2 Ft (0.61m). (Vertical blue line along the left side of the chimney in our photo). Watch out: We also notice that the chimney cap is discolored on this metal flue - possibly indicating an overheated appliance or other unsafe condition. Did you also notice that the sides of the chimney flashing are on top of rather than under the roof shingles? Another question that has come up is "do we have to measure from the chimney cap or from the (lower) opening at the top of the flue? In specifying clearances the NFPA 211 refers to the "Highest Point" of the chimney. Click any image to see an enlarged, detailed version. Vertical chimney to roof measurements are made from the top of the chimney flue opening, not the top of the chimney cap - reasoning that it is from the flue opening that an ash or spark might exit the chimney, making that the point of concern. Otherwise we could end up with an unsafe (too short) clearance of a low chimney on which someone stood a ridiculously tall "cap". Horizontal chimney clearance distance measurements are made between the building surface (roof or nearby wall or other nearby roof surface) and the nearest facing surface of the chimney side. Notice that "chimney height" is to the top of the flue opening, not the top of the chimney cap. Reader Question: Exactly where do we measure chimney roof clearances? 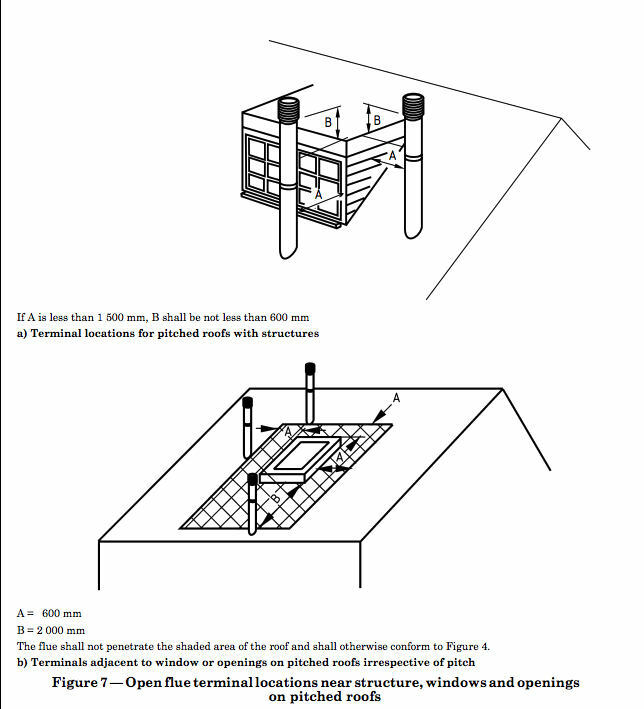 Refer to the sketch titled "Masonry Chimney Roof Clearance Requirements" and to the Dura Vent illustration just above. The line that is drawn that illustrates the 10 feet run is placed in the middle of the chimney. Depending on where you place this line has a HUGE impact on how high the chimney needs to be. If this line were drawn on the top of the chimney it would need to be substantially taller. Jason, you are dead right - the page top chimney to roof clearance sketch has long bothered me too, leading to other photos and sketches on this page that showed the required distances correctly. 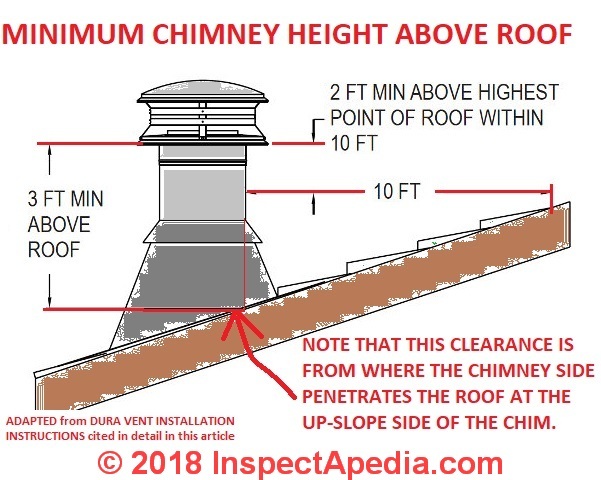 We have reviewed, edited, and adjusted all of the chimney clearance measurement drawings and photos in the article above to clarify these distances. The original NFPA-211 drawings on which the page top sketch was based were equally confusing. The top of the flue opening should be at least 10 Ft (3.1 m) away from any roof surface as measured by a horizontal line drawn from the top of the chimney flue opening to where it would touch the roof surface. The top of the flue opening should be 3 Ft (0.92 m) above any roof surface. I.e. a vertical line drawn along the up-roof side of the chimney, from the roof surface to the top of the chimney flue opening shall be at least 3 Ft in height. This is for masonry chimneys. For gas vents or a type L vent this distance must be at least 2 Ft (0.61m). Another question that has come up is "do we have to measure from the chimney cap or from the (lower) opening at the top of the flue? In specifying clearances the NFPA 211 refers to the "Highest Point" of the chimney. My opinion of the NFPA and codes is measurements are made from the top of the chimney flue opening, not the top of the chimney cap - reasoning that it is from the flue opening that an ash or spark might exit the chimney, making that the point of concern. Thanks so much again for the reminder to fix this, Jason. We welcome reader questions and comments. [Click to enlarge any image] Above: extend chimney heights to avoid downdraft problems caused by wind, roof shapes, trees, hills, or other local terrain features. Adapted from Beckett AFII Oil Burner Manual cited just below. This is the vertical red arrow at the left side of our right-hand metal chimney height sketch above. The chimney top must be three feet (or more) above the roof surface (measured right next to the chimney, at the up-slope side of the chimney). This is the vertical green line in our chimney clearance sketch above. The top of a chimney must also extend at least two feet above a roof, ridge, or other structural component that is ten feet or less away in horizontal distance. This height is shown by the vertical blue arrow shown at the left hand chimney in the sketch above and the ten foot line is shown in black in the same drawing. Take a look at the chimney height clearance requirements sketch at the top of this page. The only confusing detail in that sketch is that the "ten foot chimney height rule" horizontal line was shown as drawn mid way down the chimney - really that line is drawn from the chimney TOP to the nearest roof surface. The wind-interference chimney rule: the top of the chimney may need to be extended sufficiently to avoid downdrafts and interference due to wind. This height will be site specific, as the presence of nearby trees, hills, or other building features can direct wind so as to cause inadequate and unsafe draft. 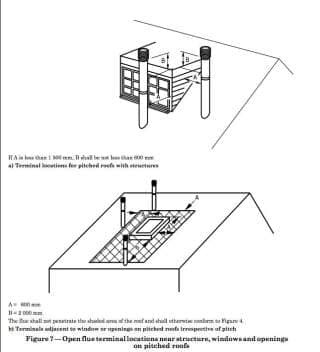 Take a look at the illustration above showing how a chimney designb must consider local wind and downdraft problems. Height Separation Rule for Adjacent Flues: this difference is not specified in the model codes. OPINION: we recommend 4-6" vertical distance separation between adjacent flues. I have an "A" frame cottage with a new metal roof. The woodstove has a 10" insulated metal chimney which extends above the roof line by approximately 7 ft. and is above the peak by maybe 1 ft.
if you were to draw a horizontal line from your chimney top towards the ridge, and if the horizontal distance from the top to the ridge is less than 10 feet, then properly your chimney needs to go up another foot. On the other hand if the horizontal distance from your chimney to the ridge is ten feet or more, you're ok as is. Reader Question: What is the chimney clearance from the chimney pipe to a second story window? Charlie I'm not sure I understand the picture and measurements of the addition you describe. If your chimney is two feet above the ridge of the upper roof it would certainly not be too close to any windows. If your chimney is two feet above the ridge of a roof over the one story addition, if you can't get more than 12 feet of horizontal distance between chimney and windows of the upper floor, you probably need to extend the chimney above the upper roof, following the ten-foot horizontal line rule we describe above. Otherwise in at least some conditions, someone is going to open an upper floor window and find smoke blowing into the room. Reader Question: what is the minimum chimney height up through a flat roof near two windows? The minimum chimney heights above roof are in the article above. For the case you describe, there are other distances like from windows, and depending on the total chimney height, even meeting the above-roof minimum distance (3 ft. on a flat roof) may not be tall enough. Question: How far from a window must the chimney cowl be in the U.K. ? I'm still trying to work this out, for a cowel chimney 12ft from my windows. Im attaching 2 pictures, the first will show a cowel chimney fitted at 12ft from my 2nd floor window, and the 2nd picture is a view from the first floor, and outside my kitchen window, this is new, due to a recent change of premises, is the cowel appropriate to be there level with my kitchen window, it is smelly and noisy from both floors even with windows closed? But you need to tell me what's being vented in the chimney: gas appliances? Generally if the outlet of a chimney is more than 10ft. U.S. or 3m E.U./U.K. it is likely to meet the clearance distance needed. However there can certainly be exceptions, in my opinion, such as building shapes, nearby obstructions, site features (hills, trees) that may blow chimney exhaust into an open window. Let's both research UK chimney codes further and report back. By the way the chimney cowl or cap is not quite the measurement point, its rather the top of the opening of the flue out of which gases emit. Carson Dunlop Associates [at REVIEWERS] sketch above shows that the minimum chimney height above a wood burning fireplace is 15', and that a shorter minimum of 5' may be acceptable above the draft hood of a gas furnace is allowed in some jurisdictions. In addition to the requirement for safety fire clearance from rooftops and other building components, separate metal chimneys that are too close to one another may cause damage resulting in poor chimney performance or an unsafe chimney. Carson Dunlop Associates [at REVIEWERS] sketch above shows that metal chimneys should be at least 16" (that's 16 inches) apart to avoid damage. In both the U.S. and Canada, the distances between adjacent flues are given by the 2015 International Residential Code, Chapter 10 (see REFERENCES) and are detailed in the IRC Section R1003.13. Where two or more flues are located in the same chimney, masonry withes shall be built between adjacent flue linings. The masonry withes shall be not less than 4 inches (102 mm) thick and bonded into the walls of the chimney. Exception: Where venting only one appliance, two flues shall be permitted to asjoin each other in the same chimney with only the flue lining separation between them. The joints of the adjacent flue linings shall be staggered not less than 4 inches (102 mm). What about the requirement for a difference in height between two adjacent chimney flues? In my opinion a height difference of 4-6" is good chimney design, but that detail is not specified in the model chimney codes. Continue reading at CHIMNEY HEIGHT EXTENSIONS or select a topic from closely-related articles below, or see our complete INDEX to RELATED ARTICLES below. 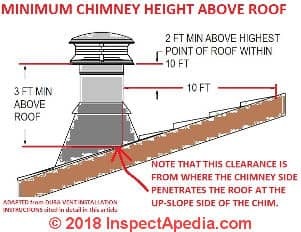 CHIMNEY HEIGHT & CLEARANCE CODE at InspectApedia.com - online encyclopedia of building & environmental inspection, testing, diagnosis, repair, & problem prevention advice. These guidelines address the inspection of chimneys and stacks. Each guideline assists owners in determining what level of inspection is appropriate to a particular chimney and provides common criteria so that all parties involved have a clear understanding of the scope of the inspection and the end product required. Each chimney or stack is a unique structure, subject to both aggressive operating and natural environments, and degradation over time. Such degradation may be managed via a prudent inspection program followed by maintenance work on any equipment or structure determined to be in need of attention. Sample inspection report specifications, sample field inspection data forms, and an example of a developed plan of a concrete chimney are included in the guidelines. This book provides a valuable guidance tool for chimney and stack inspections and also offers a set of references for these particular inspections.